It’s back!!! 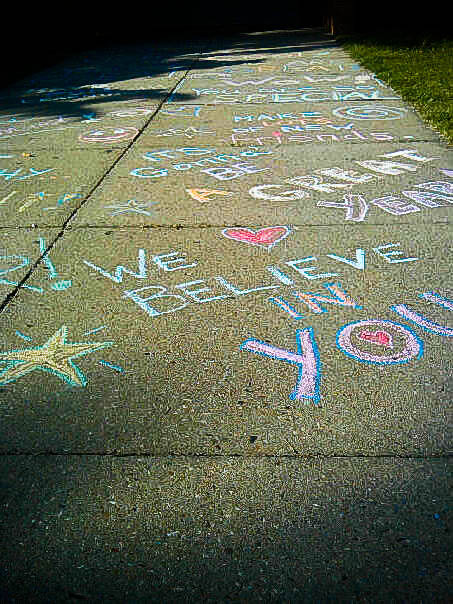 You may remember when lots of folks ALL over the country headed out with sidewalk chalk to encourage the kids of their cities on the first day of school. Well, we are doin’ it again and would love to have you join us! 6. If you decide to do this project or blog about it, please leave a comment so we can highlight your kindness work and watch it grow! Don’t forget to send me pictures and I’ll post them or simply add them to our GG Flickr Pool. What a great way to provide a extra bit of FUN in that first day back to school!! thanks Lance! you are awesome my friend, thanks for spreading the word! i know!!! so sorry! i’m a little late this year, but we did it late last year too if you are still inspired. i think sometimes the 2nd week of school can be harder when it all settles in. heck, chalk love is good any day, right?! thanks for chiming in Dawn! I’m super excited! Tonight is our sidewalk chalk love! Here’s the link to the Facebook Page: http://www.facebook.com/event.php?eid=129236430454173. Can’t wait to see what everyone’s doing! Lance pointed this post out to me, and I LOVED it! I did a birthday chalk message for a friend – covering her entire driveway as a surprise – earlier this year. Felt like a kid again! I love this idea — chalk on, friends! love the birthday love! 🙂 Thanks to Lance too! Definitely doing it again! We loved it last year in Springfield! oh Amie!!! take some of your awesome pics! Can’t wait to see! so enjoying your blog! got a little lost in it this morning! Emily & I have got Holton Elementary School covered with people coming Monday afternoon! Love this project!!! the teens and I will be heading out again this year. if anyone wants to join us in Richmond on Sunday, let me know! I saw a link to this post from Amie on FB the other day and loved the idea! I put it out to my fellow moms and we’ll be out Monday night at Legacy Elementary in Ashburn, VA. Can’t wait to see how it turns out! What a great success our chalk love was – everyone loved it! (except possibly the janitors). Here’s a link to some of my photos. The Melvins will be hitting up Bellvue today!!! We covered Jennie Dean Elementary, Metz Middle School and Signal Hill Elementary in Manassas. My favorites? Your teacher is nice and It’s my first day too! I think we had about 50 people turn out for our Holton chalk love – a good mix of parents, kids, teachers and even a few community members whose kids aren’t at Holton yet! There’s talk about making it organized every year and adding a potluck meal afterwards. We met at 4pm and, after we were done, a bunch of kids ended up on the playground while grown ups visited. I think it also helped many of us get settled into the idea of going back to school with the opportunity to connect with old friends before the first day.